Whether you're a pro at managing the Family & Medical Leave Act (FMLA) or still trying to gather information about it, we have a great new resource for you! 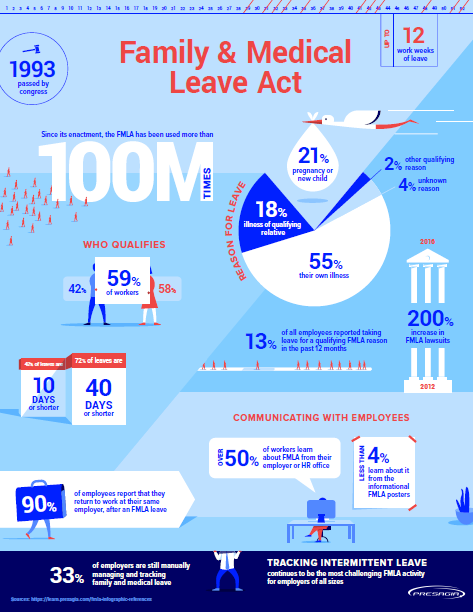 We created a new FMLA infographic to bring you up to date statistics and information. As you may or may not know, the FMLA is a federal act that was enacted in 1993, to provide employees who work for covered employers up to 12 work weeks of unpaid, job-protected leave for certain family and medical reasons. Click on the image below (or right here) to view and download a PDF of the infographic! Additionally, if you'd like to view the sources for each of these statistics, please visit this page.